If you’re just joining the blog, Grace Lightbourne, the teen angel main character from my novel Winging It! Has been interviewing authors since April 12th. Today I’m excited to have popular chick-lit author Dee Ernst. 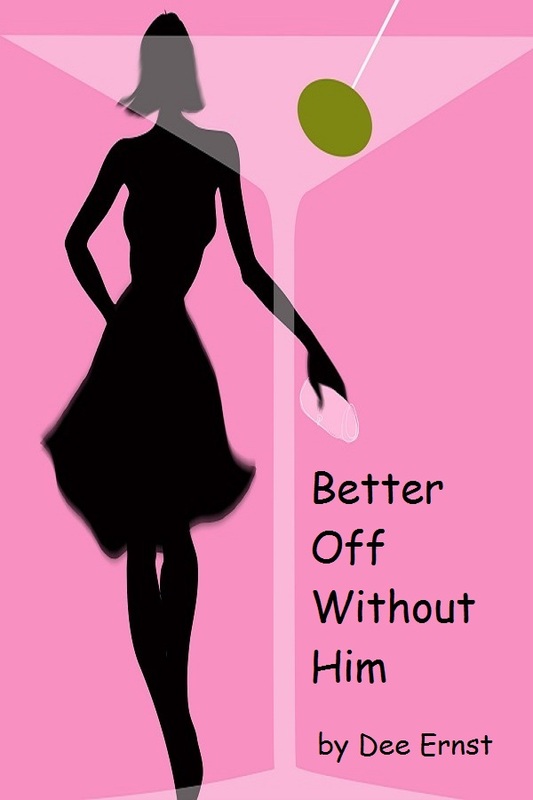 Before she becomes the latest of Grace’s victims, here’s a little about her novel Better Off Without Him. Mona Berman is an expert at Happily Ever After – after all, she’s a best-selling Romance writer and happy endings are what she does best. So when her husband of twenty years leaves her for somebody 15 years younger, 20 pounds lighter, and French, she’s got a lot of adjusting to do, both personally and professionally. Lucky for her she’s got three savvy teen daughters, a few good friends, and Ben, the world’s sexiest plumber, to help her along the way. This sounds great Dee! And fair warning: I’m turning you over to Grace now. Hi Dee! I love your cover. It’s pink like mine and very fashionable. So, your muse must be doing a great job inspiring you. What’s the next project they’re helping you out on? My next project is a YA – two sisters and the supernatural (of course). But I’m also playing around with another comedy – this time about a woman whose adult children all move back in with her. Does supernatural mean super powers? ‘Cause I have those and that gives us even more in common than just pink covers. Do you think I’m like any of your characters? Maybe? Hmmm…that makes me wonder…which of your characters are you most like? I am a lot like Mona in Better Off Without Him. Except that I’m not nearly as rich or successful. On the plus side, I’m still happily married and she’s not. Bummer on the rich thing. It seems to be important to a lot of Humans. Don’t shoot me on this next question, okay? What’s your favorite book of all time? Favorite book? OF ALL TIME??? Impossible. Put down the gun, Dee. In the top ten are – To Kill A Mockingbird, The Moonspinners, and Random Harvest. Great answer! Thank you and, whew, I’m glad we made it through that one. Okay, now I know Mona has a thing for Ben, so in your opinion what a guy swoony-worthy? For a guy to be swoon-worthy, even a fictional one, he has to be smarter than I am. He also better have a sense of humor. Aww…I really love that. Now if you could go to a concert in Heaven with the smart, funny guy, who would you go see? I’d love to see John Denver. He was a favorite of mine for a long time, and I still miss him. Let’s switch gears here. Confession time. What’s your biggest writing sin? Yep. Think big. Gigantic even. I can’t type. Seriously. I still have to look at the keys, and even then I make tons of mistakes. I’m waiting for the affordable voice/type whatever so I can just tell the computer what I mean and it types it for me. That’s really not a very big sin, Dee, and you know what? My author wants one of those pens so you can handwrite and it becomes a typed manuscript. I’m thinking since your writing sin is so small, you must be follow the rules, right? Or are you a rebel? I’m probably more of a rebel because I really don’t care what people think of me. I believe in rules. I think they are necessary for a civilized society. But I don’t follow them because I’m afraid of what will happen to me if I don’t. Yeah, I totally get this! Like even though all the other Angels look down on Guardians—so what. I gotta be me and all that junk. You go, Dee! What inspires you to stay true to yourself in your writing (and life)? I am blessed with great friends – wise and funny women who lead interesting lives. It’s amazing what I can get from them. Friends are definitely a blessing! You sound like a fortunate woman. Better Off Without Him was about re-inventing yourself. Women do that all the time, I think. It’s possible, no matter what happens to you, to build something bigger and better, as long as you keep trying. Having friends and family behind you is a huge plus, of course. Last question, Dee. Is there anything you’d like me to mention to your Guardian Angel? ‘Cause I totally have contacts. You can mention to my Guardian Angel that Florida property values are still low, and if she works fast and gets me on the Bestsellers List, I can still get a great beach house for a steal! And I’ll be back tomorrow with *flips through papers* YA author Brina Courtney. So come back then! May 8, 2012. Tags: author interview, Better Off Without him, confession, Dee Ernst, guardian angel, inspiration, Shel Delisle, Winging It!. author interviews.